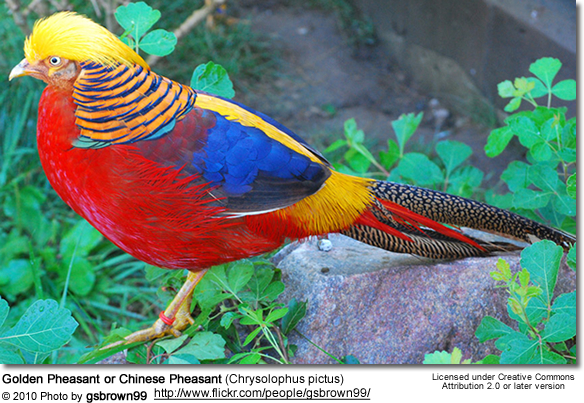 The Golden Pheasants or Chinese Pheasants (Chrysolophus pictus) are native to forests in mountainous areas of western China. 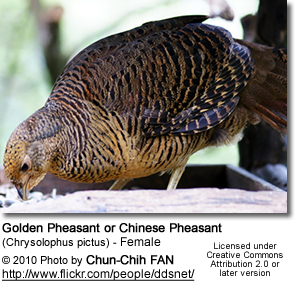 However, feral populations of these gamebirds have established themselves in Florida, USA, United Kingdom and elsewhere. 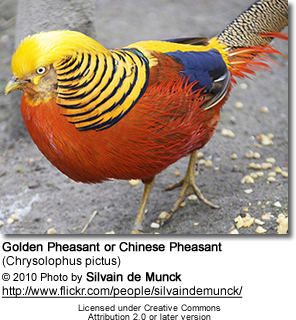 In captivity, the wild form of the Golden is often referred to as the Red Golden Pheasant. 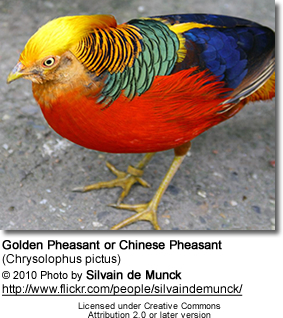 The males of these species are one of the most brilliantly colored of all birds. 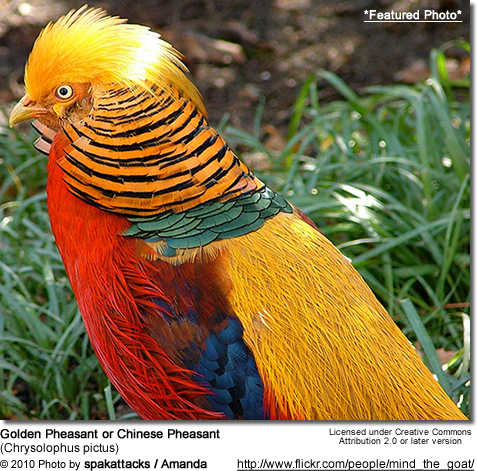 Golden Pheasants are commonly found in zoos and private collections, although frequently they have been crossed with the similar Lady Amherst's Pheasants. Many of the color mutations of this breed in existence today are believed to originate from crosses between Amherst and Goldens. It is very difficult to find birds that are completely pure representatives of this species. 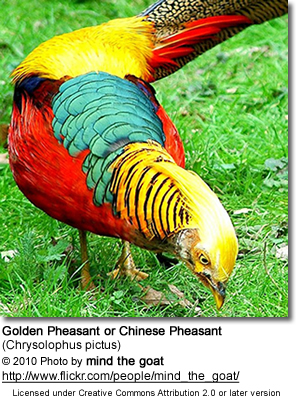 The average lifespan of Golden Pheasants is 5 - 6 years; however, captive birds that are well taken care of could live 15 or even 20 years. The adult male is about 40 inches (~100 cm) in length, with his tail accounting for two-thirds of the total length. 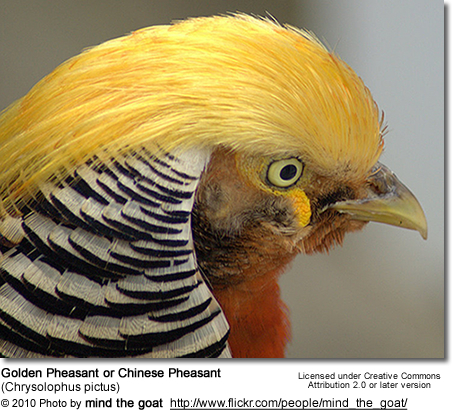 This is an unmistakable pheasant, with a golden-yellow crest with a hint of red at the tip, a golden rump and bright red body. The deep orange "cape" can be spread in display, appearing as an alternating black and orange fan that covers all of the face except its bright yellow eye,with a pinpoint black pupil. The face, throat, chin, and the sides of neck are rusty tan. The wattles and orbital skin are both yellow in colour, and the ruff or cape is light orange. The upper back is green and the rest of the back and rump are golden-yellow in color. The tertiaries are blue whereas the scapulars (shoulder feathers) are dark red. Another characteristic of the male plumage is the central tail feathers which are black spotted with cinnamon as well as the tip of the tail being a cinnamon buff. 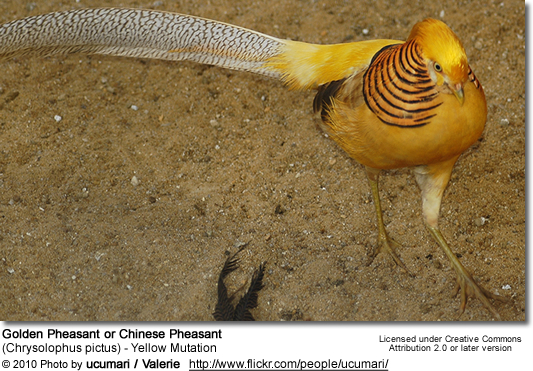 The upper tail coverts are the same colour as the central tail feathers. Males also have a scarlet breast, and scarlet and light chestnut flanks and underparts. 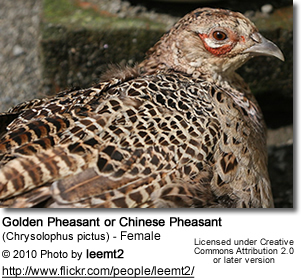 The female (hen) is much less showy, with a duller mottled brown plumage similar to that of the female Common Pheasant. She is darker and more slender than the hen of that species, with a proportionately longer tail (half her 60-80 cm length). The female's breast and sides are barred buff and blackish brown, and the abdomen is plain buff. She has a buff face and throat. Their natural habitats are dark young conifer forests with sparse undergrowth. They feed on the ground on grain, leaves and invertebrates (= animals without internal skeleton, such as insects, larvae, earthworms, millipedes, snails, spiders), but roost in trees at night. Whilst they can fly, they prefer to run: but if startled they can suddenly burst upwards at great speed, with a distinctive wing sound. Although they can fly in short bursts they are quite clumsy in flight and spend most of their time on the ground.